This one will brighten up the cookie plates. It’s a beauty. That’s what mom said when she tasted the thumbprint cookies I’ve been making with our gorgeous imported Lebanese preserves. I agreed, knowing that the plates we make, while always delicious, aren’t always…colorful. There are Lebanese traditional cookies, which for us means baklawi. And then some more baklawi. Plus graybeh and the date krispie balls. Color: tan, white, tan, white. Then there are the other traditionals, which consist primarily of frosted cut-outs with mom’s buttercream (vanilla) and sprinkles—there’s an attempt at color, but on the plate, they really just read white. Add a chocolate crinkle or two to this group. Brown and white. Also the candies, the glorious Abowd-style hand-dipped chocolates and my almond dragees, which I learned in culinary school and are insanely addictive. Still though: brown. White. 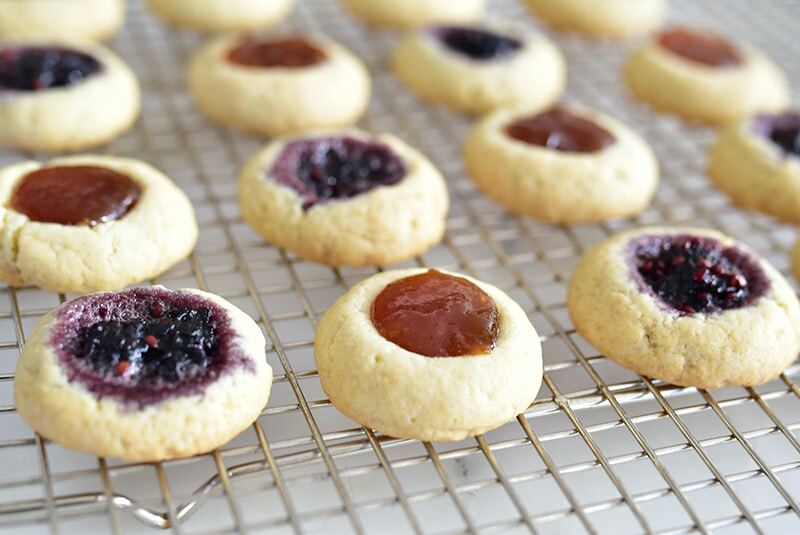 Enter the thumbprint cookies. 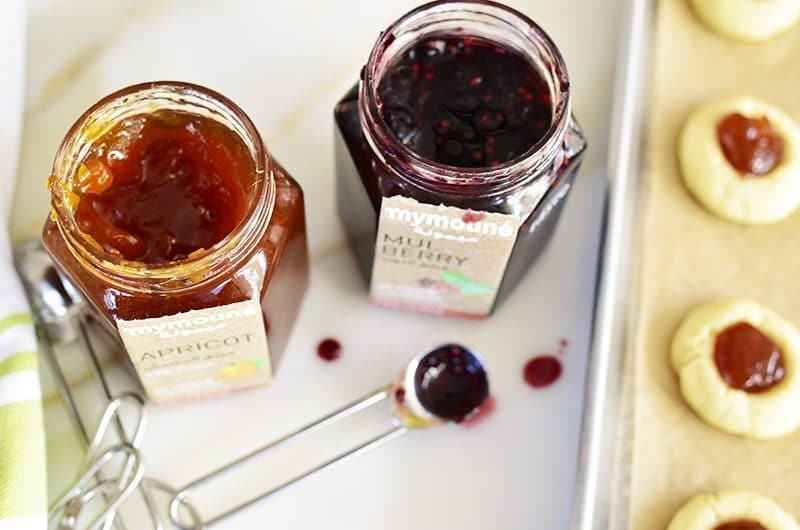 My sister Peggy brought these to us in her routine exploration of all things cookie baking, and in her ongoing quest to find ways to get fruit preserves into her mouth other than off a spoon. This is a mighty fine way, right up there with a jam-laden tart or her jam bars (good enough to share here, but their crumb top leaves us in the land of colorless). 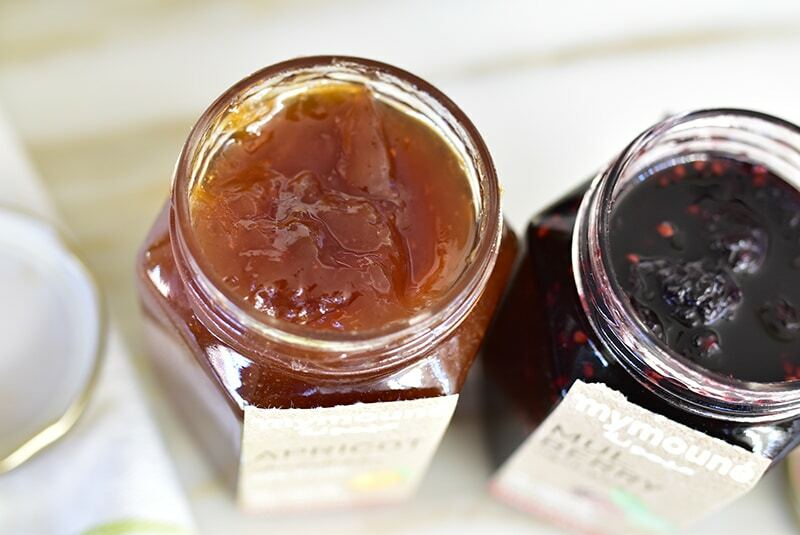 Her jams of choice for her thumbprints have always been red fruit, raspberry or strawberry. I’m surprised it took her sister to land on using our favorite preserves from Lebanon, apricot and mulberry, in the cookies…. Their flavor is WOW!/POW! delicious, the perfect pairing with the cookie itself, a buttery/cream cheese dough rather than the typical oaty/nutty thumbprint doughs. And the color? The color sends these over the top, and to the top of the holiday cookie plate. They are all glistening exclamation points of jewel tones—girls who make our beloved baklawi and friends, who have great personalities but run shorter on looks, feel bad for being so glamorous. If your cookie plates are already a riot of color, the thumbprints will be right at home. If you’re not looking to go all cookie plate, but just to cookie with a cup of coffee or tea, I think we’ve all just found a new go-to. The recipe makes a ton of cookies, which you can freeze before baking, and there sits a big bag full to reach for and bake off whenever you need a little glamorous, a little beautiful delicious in your day. This recipe is adapted from Cook's Illustrated Holiday Baking magazine. I love to add orange blossom water to the cookies; all-vanilla is good too. To make-ahead and freeze the cookies, after indenting the unbaked thumbprints, freeze them on cookie sheets, then place in freezer bags. Bake from frozen (don't thaw) for about 15 minutes, then reshape the indentations with the back of a teaspoon and proceed with the recipe as usual from there. Preheat oven to 350 degrees. Line 2 large baking sheets with parchment paper. In a medium bowl, whisk the flour, salt, baking soda, and baking powder. Beat the butter and sugar on medium speed until the mixture is light and fluffy, 3 to 6 minutes. Beat in the cream cheese, egg, flower water, and vanilla until combined, about 30 seconds, scraping down the sides of the bowl as needed. Reduce mixer to low and slowly add the flour mixture just until combined. 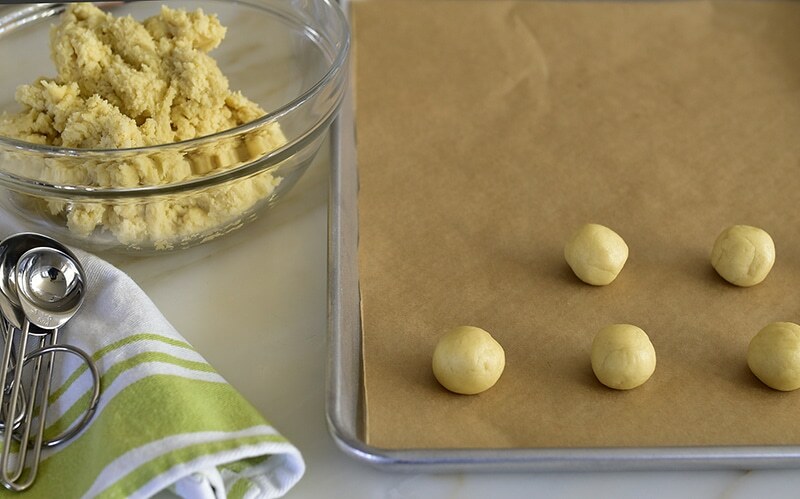 Roll the dough into balls between the palms of your hands, about 1 ½ teaspoons of dough per ball. Place them on the prepared baking sheets about 1 ½ inches apart. Use your thumb, moisted in water to prevent sticking, to indent the center of each cookie. Bake until the cookies are just beginning to set, about 10 minutes. 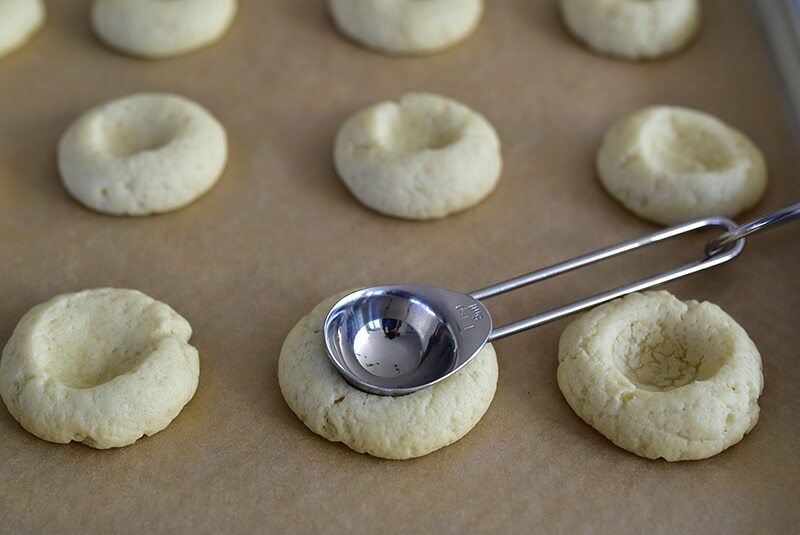 Remove the pan from the oven and, working quickly, reshape the indentation using the rounded bottom of a teaspoon. Use a small spoon to carefully fill the indentations with jam. Return the cookies to the oven and bake until light golden, 12 to 14 minutes. 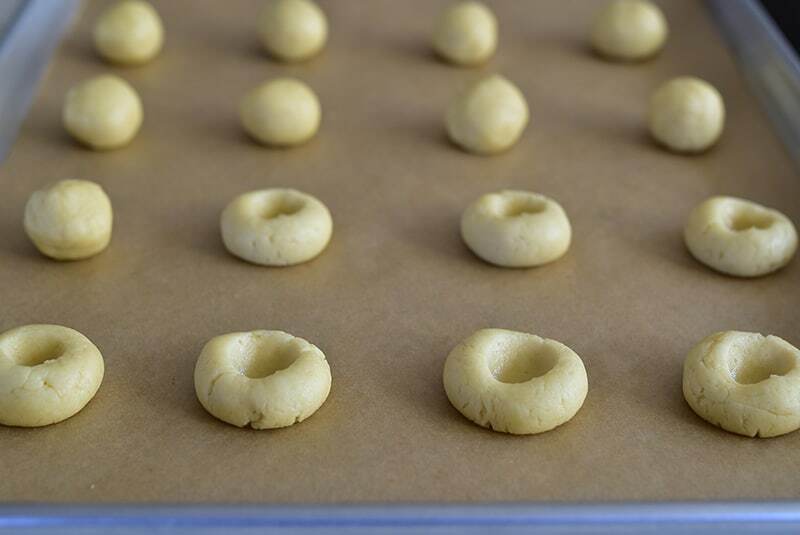 Cool the cookies for 10 minutes on the sheets, then transfer to a wire rack to cool completely before serving. 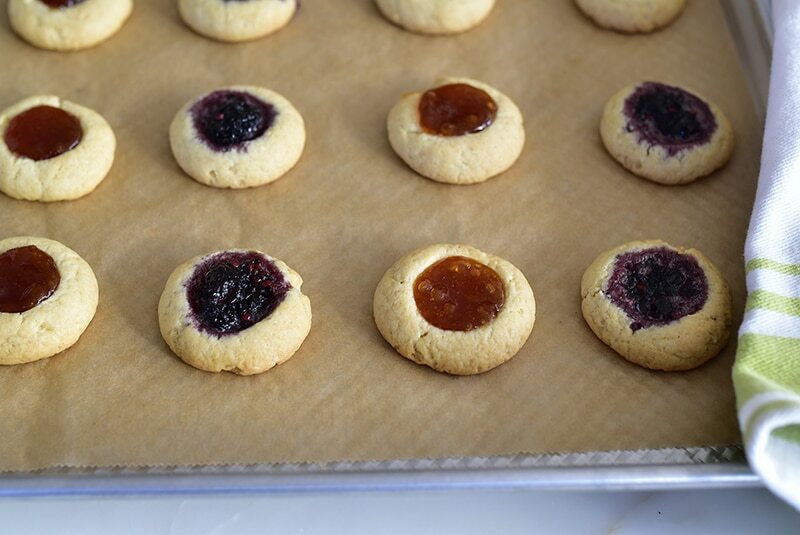 2 Responses to "Apricot and Mulberry Jam Thumbprint Cookies"
What is orange blossom water? Can the recipe be made with orange juice? Orange blossom water is made from distilled orange blossom petals. It adds an “essence” of the flower to the cookies which can be detected in the taste and scent. It is not the same thing as orange juice, as it comes from the flower and not the fruit itself. I used the Al Wadi brand which I purchased on Amazon and filled the cookies with blood orange marmalade from Home Goods. Delicious!